The Alton Goin Museum is home to many interesting antiques and memorabilia in our collection. Most of the items were donated by people who’ve lived here or whose families were some of the early settlers or residents of the Portage area. Some of the items are general-interest items from days gone by. 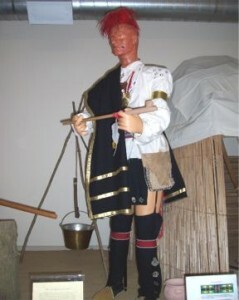 Here are some pictures of a few of the items on display at the Museum. These photos are just a sample, though. There’s lots more to see. And if you haven’t visited yet this year, you’ll be surprised at the museum’s new look. The layout and displays have changed. There are also all new things to see, so come on by! 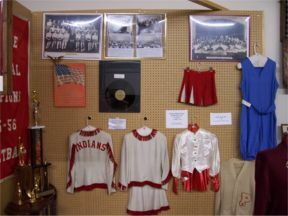 Miscellaneous Portage High School memorabilia such as old photos, cheer-leading uniforms, basketball shoes, and trophies. 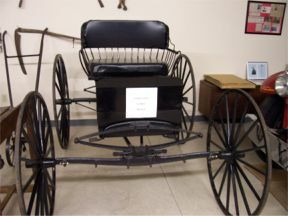 A horse-drawn buggy once owned by early members of the Samuelson family. 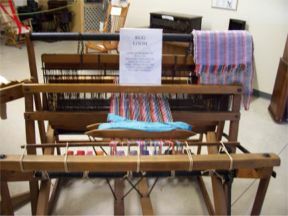 An old loom used to weave rugs. 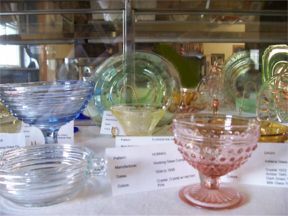 Some nice examples of different-colored Depression-era glass. 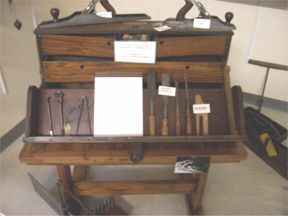 A tool chest used by George Samuelson. It includes such items as an antique jack plane, joiner plane, and preacher. 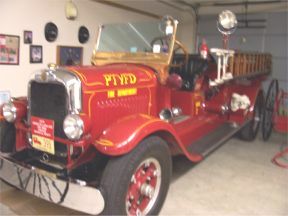 A 1929, American LaFrance firetruck. It was used by the Portage Township Volunteer Fire Department. 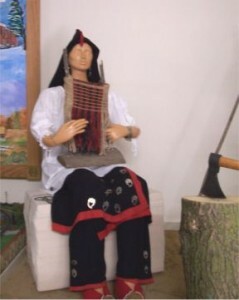 A mannequin wearing reproduced clothing of the type worn by Potawatomi Indian women.